It doesn’t really matter whether you like pizza, pasta or antipasti, wine or grappa. You get all of it here served with one common ingredient – Italian temperament. To be happy in life man needs to belong somewhere. It’s a place where family, friendship and sincere embrace come first. Yes we tend to be noisy, our forks and knives are clinking a bit louder and when we toast we usually spill beverages from our glasses. But then again – so what? This is how we live our lives! 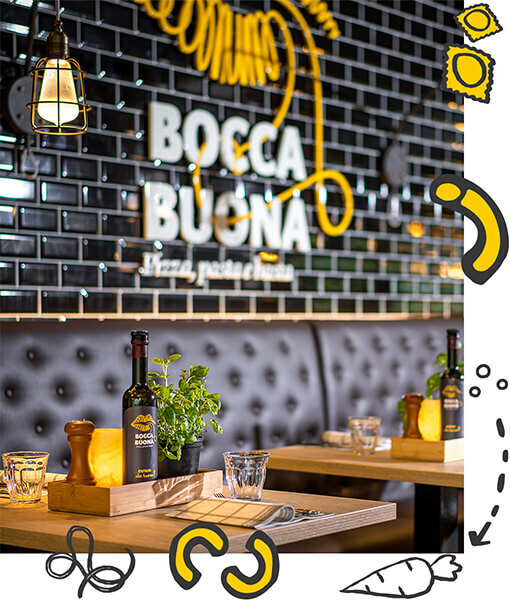 Here at Bocca Buona you’ll find those long traditional Italian tables where the whole family and friends would gather. We love easy going attitude, all the buzz of voices and good music. Everybody is themselves, our staff is nice and casual, just as informal as the design of our restaurant. We want you to feel at home, that’s all. Our hearts and minds are as open as our kitchen. There’s nothing to hide and you can peep in to see how we prepare meals and discuss them with passion.